The best time to visit Ireland is in April, May, and June, as well as in September and October. Even though there are never any promises when it comes to Irish weather, spring and autumn tend to be relatively mild and have fewer crowds (and lower prices) than during the peak of summer. Visiting Ireland in winter can mean colder temperatures and closed attractions, though the relative quiet can be perfect for exploring both cities and countryside. There are also substantial savings to be found on hotels when traveling outside the main tourist season. With a long history, lively Irish festivals, beautiful natural scenery, farm fresh food, and plenty of cozy pubs, there is something new to discover at whatever time of year you plan to visit Ireland. The weather in Ireland can pass through every season in a single day so it is nearly impossible to be guaranteed a spell of good weather, even at the height of summer. Speaking of which, summertime temperatures rarely top 70 degrees Fahrenheit, so be prepared with layers of clothing in order to bundle up as needed in every season. The coldest temperatures settle in from November to February and are usually accompanied by plenty of rain and short daylight hours. Outdoor activities like hill walking are best saved for spring, summer, and fall. However, the temperature rarely drops below freezing so visitors are unlikely to be caught in a snowstorm. Regardless of the time of year, plan for cool—but not icy—weather. Naturally, there will also be rain. In fact, it can rain up to 225 days a year on the Emerald Isle. It is all of that precipitation that gives the hills their famous green shades so embrace the drizzle (and be sure to pack weather appropriate shoes). With a relatively small local population, Ireland gets more tourists than it has residents throughout the year. July and August are the traditional holiday months in Ireland when seaside spots are particularly crowded with locals. Those peak summer months are also the most popular time for outside visitors to fly to Ireland, which essentially doubles the competition for accommodation. July and August are also when the top places to see in Ireland will be the most crowded. Many are outdoors and can handle the crowds, but the hordes of people might distract from the natural beauty. Summer "bank holiday" (three-day) weekends are the most popular time for travel in Ireland. Outside of summer, St. Patrick’s Day on March 17 draws a large number of revelers to Dublin. Large crowds also descend upon the Irish capital on the first weekend of December, which is the kickoff to holiday (and holiday shopping) season. January is off-season in Ireland and many attractions, especially outdoor sites, have limited winter hours. While there will be rainy days and long winter nights, the Christmas crowds have disappeared and accommodation prices drop after the holiday season. First Monday in January is Handsel Monday (though the gift-giving tradition is falling out of fashion). It is more common to see closures or family celebrations on January 6, which is the Epiphany (one of the 12 days of Christmas), also known as the "Women's Christmas” or "Little Christmas." Dates vary every year, but the Temple Bar Tradfest is usually held toward the end of January in Dublin. Plan to spend plenty of time in cozy pubs because the February weather in Ireland is particularly dreary. It usually stays around 40 degrees Fahrenheit, and while it is not literally freezing, the days are still short and outdoor excursions are risky. Some country hotels may be closed for the low season, but others will offer good deals on accommodation to make up for any possible inconvenience. February 14 is Valentine's Day and is a good day to go to Whitefriar Street Carmelite Church in Dublin where the saint's relics are kept. Both Pancake (Shrove) Tuesday (Pancake Day) and Ash Wednesday, which marks the beginning of Lent, may fall in February and are widely observed. March is still low season in Ireland except for mid-month when that well-known Irish holiday comes around. St. Patrick’s Day is big business in Ireland and there will be a spike in prices and happy crowds around March 17. It is not quite spring, but major attractions like the Cliffs of Moher and Christchurch Cathedral are still open year-round. March 17 in Dublin is a must, though more local celebrations will also be observed in every corner of the Emerald Isle. Sometimes Easter Sunday falls in March and is widely observed. If this is the case, there will also be celebrations in commemoration of the 1916 Easter Rising. Things start to come back to life after a winter hibernation as the days start to get noticeably longer and the temperature heats up to balmy levels for the area, between 50 and 60 degrees Fahrenheit. Spring is one of the best times to visit Ireland. Don’t be tricked on April 1, which is April Fools' Day in Ireland. Easter sometimes falls in April. Good Friday is a public holiday in Northern Ireland, and Easter Monday is a public holiday in both the Republic of Ireland and in the north. May is one of Ireland’s warmest months, with averages between 64 and 68 degrees Fahrenheit. Spring and early summer in Ireland can be the perfect time to rediscover the rolling green countryside or hit the bogland for a walk through one of Ireland’s national parks. May 1 is Labor Day (International Workers Day ) and is a public holiday in the Republic of Ireland. There may also be events organized by unions. Head to County Clare to hear live music at the Fleadh Nua festival which takes over the town of Ennis. School is out and the crowds begin to arrive in Dublin. While the crowds at major destinations may start to build up, there is still plenty of space to go around. Accommodation prices begin to rise but book early enough to lock in better rates. June 16 is Dublin’s day to celebrate James Joyce and is known as Bloomsday. It takes place because the author’s famous book Ulysses is set on the same day. Plan a trip back to Claire for the Ennis Street Festival, which takes place in June. This is the height of Irish summer—and the warmest temperatures of the year usually hover a bit above 60 degrees Fahrenheit. 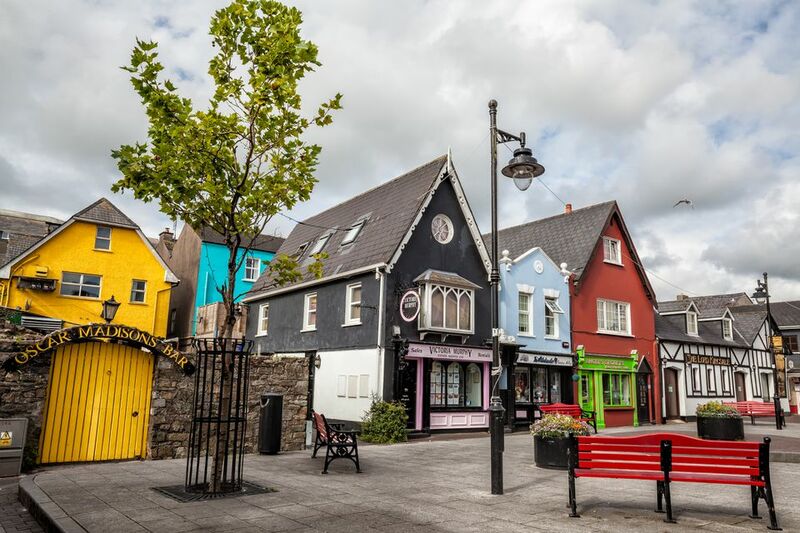 July is one of the best months for getting outside to see the natural wonders because it tends to stay light until around 11 p.m.
Head west to Galway for the city’s art festival, which usually takes place in the second half of July. Ireland’s relatively warm weather usually carries over to August, though this can also be one of the busiest months on the Emerald Isle. On the plus side, there means that there are plenty of festivals and events (though the high prices will likely reflect the fact that so many other visitors are also competing for the hotel rooms). Killorglin in County Kerry is the place to be August 10 to 12, when a goat is crowned king during the Puck Fair, one of Ireland's oldest traditional events. The country’s largest music festival, the Fleadh Cheoil na hEireann, takes place in a different town every year. The truly Irish guilty pleasure of the Rose of Tralee (a beauty and talent contest) is held in Tralee, County Kerry. September is a lovely time to visit Ireland as the biggest crowds head home but the days are still long and warm enough to enjoy some outdoor activities. The Galway Oyster Festival is a tasty treat on the western coast. The Irish weather tends to hover around the mid-50s in October. This is a good month to find deals on accommodations before some of the small or more rural hotels close for the low winter season. The Dingle Food Festival usually takes place in October. As winter begins, some attractions and country hotels begin to close for the season. However, always bear in mind that while the "Visitor Center" at some outdoor attractions like Tara might be closed in winter, the attraction itself simply cannot close, you are free to explore it without expert advice at any time. On November 11, experience a Saint Martin's Day. It is also Remembrance Sunday in Northern Ireland. Dublin buzzes with holiday cheer in early December as shoppers brave the rain to dash between shops and pubs. Be wary of closures during Christmas week and higher prices as Irish expats head home for the holidays. In addition to Christmas Day on December 25, December 26 is St. Stephen's Day in the Republic of Ireland and known as Boxing Day in Northern Ireland.